KEK’s new organisational structure regarding the ILC project. With the future in mind, Japan’s High Energy Accelerator Research Organisation, KEK has made a change to its organisational structure regarding the ILC project. By doing so, KEK is getting ready for the “green light” from Japanese government. “The main purpose of this change is to make the functions and roles clearer,” said Masanori Yamauchi, Director General and the head of the Planning Office for the ILC. The Planning Office was set up in February 2014, and it has been accountable for two missions: project promotion, and technical development. The previous structure was intended to manage all ILC-related activities in KEK, and it worked to solidify the foundation to advance the ILC project in the laboratory. “Now, we are taking the next step. Two missions that the ILC Planning Office has been managing are quite different in nature, and require different expertise and manners of thinking. The new structure shares those different roles, and make them conducive to better performance,” said Yamauchi. From Japanese fiscal year 2016 starting 1 April, the Planning Office is concentrating on project promotion tasks, and accelerator R&D work is taken care of by the Accelerator Laboratory at KEK. The Institute of Particle and Nuclear Studies is in charge of physics and detector research. 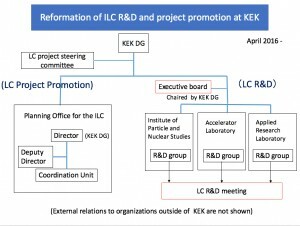 “The laboratory’s policy making and budget allocation regarding ILC R&D will be coordinated by the executive board,” says Yasuhiro Okada, executive director of KEK and deputy head of Planning Office. The members of the executive board consist of six senior scientists including the Director General and the Director of Accelerator Laboratory, Seiya Yamaguchi. “While the executive board oversees technical aspects of KEK’s ILC activities, the Planning Office will take measures to issues and missions concerning various other aspects of ILC project promotion. All these efforts will help promote the project towards the realisation,” he said. “From the technical development point of view, nothing has been changed,” said Shinichiro Michizono, professor at Accelerator Laboratory who is now leading the ILC-related technical efforts at KEK. “We will continue to focus on two technical challenges: superconducting radiofrequency technology, and nano-beam production and stabilisation,” said Michizono. Yamauchi also points out the advantage of the organisational change in the view of mobility of human resources. “Now those accelerator R&D activities are officially under the responsibility of the Accelerator Laboratory, and this change facilitates the migration between research programmes at KEK,” he said. Because of the highly international nature of the ILC project, it had been treated as a somehow “exceptional” project at KEK. Now, the psychological barrier caused by this organisational anomaly has been cleared, and it is much easier for scientists who are engaging in other projects at KEK to get involved in ILC-related activities. The new structure will allow the Planning Office at KEK to actually plan and prepare for the future of the ILC. It is a very good step and it will have great impact in coming days.